The layout of Reefside ensures that everyone in your party has beautiful rooms, private bathrooms, and complete privacy. The common areas are comfortable and spacious, and the pool deck is large and welcoming after a day at the beach. Speaking of the beach, its only a short walk down the hill to Chocolate Hole, where local fishermen and a few visitors are the only ones along the coastline. 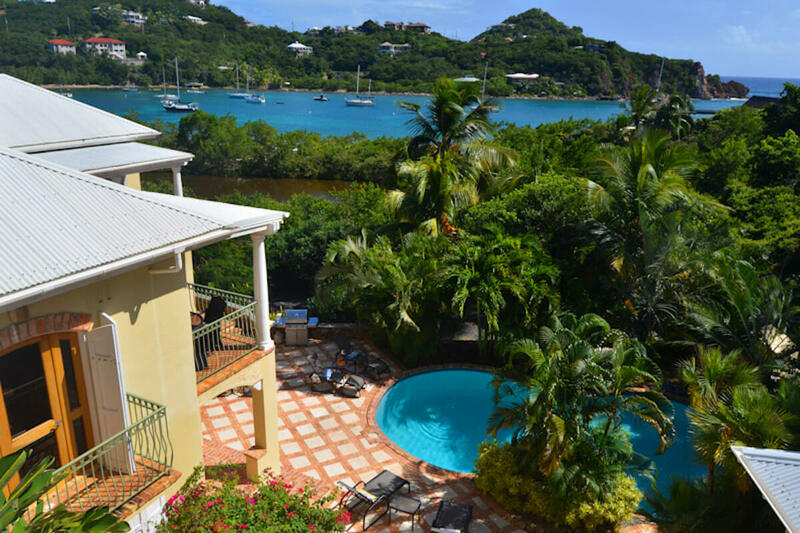 Reefside Villa is set on a private beach in Chocolate Hole on St. John’s south shore. This property has a spacious floor plan and 180º tropical views. The manmade beach can be accessed from the pool deck, and it’s an easy walk to get to swimming and snorkeling. With a large scalloped pool and a plush bar pavilion, the terrace is ideal for casual lounging and more elegant fare. Bricks and stone surround the pool and holds several loungers, dining tables, and a grill. Lush palms and shrubs add shade and ambience. An air-conditioned office is on the pool level, and includes a large mahogany desk, comfortable seating for six, a copier/fax machine, and a telephone. To enter the fully air-conditioned villa, guests park on the third level and follow a landscaped walkway down to the main level. The main level holds the living room and kitchen, as well as the dining area. Classically Caribbean details such as terra cotta floors, a 17-foot beamed ceiling, and arched mahogany doors and windows are balanced with global artifacts and artwork, with an emphasis on African art. The living room features a 36” Sony satellite TV, a DVD player, four-speaker surround sound, WiFi, and a docking station. An elegant chandelier hangs over the dining table, which seats 10. A built-in bar with a mini fridge and arched mahogany doors finish the room. The chef’s kitchen combines granite countertops, mahogany cabinets, stainless steel appliances, a blender, a coffeemaker, a food processor, and a bar that seats four. All five bedrooms are private, because each is located in its own building. Each bedroom has a king bed, a TV, a DVD player, and an ensuite bathroom. An exterior staircase located off the living and dining rooms leads up to the master bedroom on the third level. From the living area on the main level, an exterior staircase leads down to the poolside cabana bedroom and the main house bedroom. The two third level suites are separated by a breakfast patio. Both are oversized and have a 15 ft beamed cathedral ceiling and a small balcony with harbor views. The master bedroom is also on the third level, but is larger than the guest bedrooms and has the best views. The pool cabana bedroom is located in a separate building a half level above the pool and has a small balcony. The fourth bedroom is located three steps above the pool deck on the ground level of the main house. Reefside Villa’s waterfront location is just a short walk down to a sandy beach, perfect for snorkeling in the harbor. Cruz Bay is only a five minute drive away and is 15-25 minutes from the Northside beaches. Short walk down to the beach for snorkeling. $50 non-refundable security deposit waiver fee; $50 fee for arrivals after 7 pm.